CLIVUS MULTRUM works hard to provide the best composting toilets and greywater irrigation systems for parks and recreational facilities throughout North America and beyond. The Clivus Multrum Web site includes detailed product and project information, case studies, feature articles and a schedule of upcoming events, including tradeshows and conference appearances. The site gives visitors a clear picture of what Clivus systems are, how they work and where they're used. BRADLEY CORPORATION recently redesigned its Web site at bradleycorp.com, offering customers more user-friendly product features and graphics. The site is designed to provide one-click access to information, such as products and application photos. A sales locator has been added, as well as a "Guest Book" for visitors to sign in and receive the latest news. SURFACE AMERICA is an industry leader with a complete line of playground and sports surfacing systems. 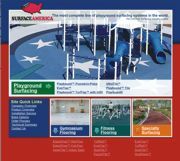 SurfaceAmerica.com offers easy-to-understand information on the world of surfacing for play, recreation and sports. Divided into four sections—playground surfacing, gymnasium flooring, fitness flooring and specialty surfacing—the Web site provides product overviews, installation service details, a description of the ordering process, comprehensive technical seminars and 10-part and three-part specifications. The COVERMASTER Web site is a comprehensive site on protective sports surface covers for gymnasiums, stadiums, baseball, football and soccer fields, and ice arenas. Detailed information includes photos and videos of gym floor covers, raincovers, turf blankets, concert covers, various handling systems, ice rink covers, stadium seat covers and many others. The site loads quickly, is easily navigated and includes a quotation request form. Informative literature complete with technical specifications can be downloaded as well. LINCOLN EQUIPMENT INC. announced the rollout of its newly updated Web site, with access to more than 6,500 high-quality, commercial-grade products online. The site allows interactive shopping by item, category and brand. Create your own orders and quotes, and track your individual account history. The site also provides access to user manuals, product documentation, parts lists and MSDS. 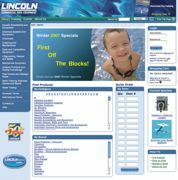 The Lincoln Catalog and Quarterly Specials can be browsed or downloaded directly from the Web site. WRISTBAND RESOURCES provides a large selection of quality Tyvek, plastic and vinyl wristbands. On the Wristband Resources Web site, you can view custom printing options as you scroll over the Custom Wristband Wheel. To place an order for custom wristbands, call 800-481-2263. Don't forget to place your order for stock wristbands online. All orders ship out within 24 hours of the order being placed. Commercial-quality outdoor park, campground and street landscape products are what you'll find at the PILOT ROCK Web site. The Pilot Rock brand includes park grills, campfire rings, picnic tables, park and street benches, trash and recycling receptacle holders and lids, smoker waste receptacles, lantern holders, bike racks and more. New products and designs are always being added. Shop online using the Request A Quote form. Quality, value and customer satisfaction are PERFORMANCE ATHLETICS' main goals. Products include volleyball posts and nets, tennis posts and nets, arched and hooded baseball backstops, football goals, soccer goals, bike racks, tetherball poles and basketball poles, backboards, goals and nets. 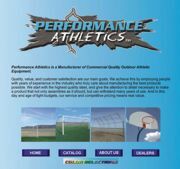 Performance Athletics starts with the highest quality steel and gives the attention to detail necessary to make a product that not only assembles as it should, but can withstand many years of use.